The Lizzie Bennet Diaries team screens and talks about the show. Left to right: The moderator and panelists: Jay Bushman, Margaret Dunlap, and Ashley Clements. 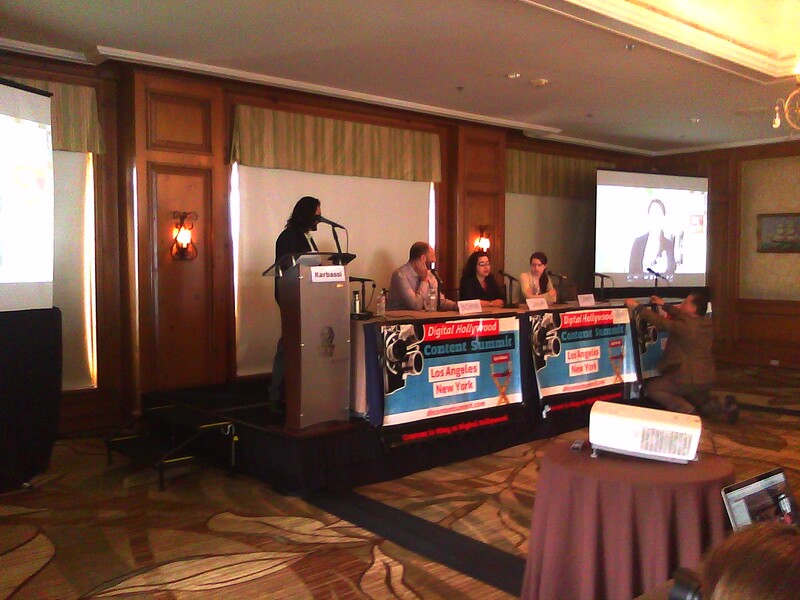 On May 1 the Lizzie Bennet Diaries team of Jay Bushman, Margaret Dunlap, and Ashley Clements spoke on the panel Screening Series: TV and Web Series – Musicals and Millennials at LA’s Digital Hollywood Content Summit. After a screening of episode 78 – The Pemberley Digital Arc, they explained the transmedia production process used to highlight character subtext with sites such as Instagram and Twitter. Next they described the impact of the huge positive response to the series, even showing off a few pieces of fan art. Ashley Clements, who played the title character, noted the amazing success of the LBD DVD project on Kickstarter which launched at the end of March shortly after the show ended. With more than a 700% reach beyond the original goal amount of $60K, she described the sentiment behind that effort as a strong show of support and also some fans’ way of ensuring that her cat would continue to be well fed. The trio also addressed a few behind the scenes questions about the show and a pressing question about pressure from fans eager to see William Darcy. Q: Why such a long wait for Darcy to make a physical appearance in the show? While Ashley is prepping for her next closeup, next up for the producers: Welcome to Sandition… make that Welcome to Sanditon, coming very soon!